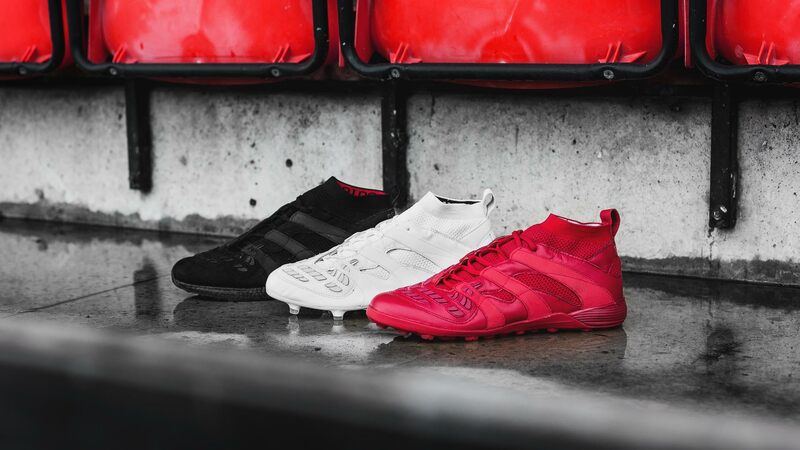 There is something major coming your way from adidas.To celebrate David Beckham’s glorious career and the Predator boot that he wore throughout, adidas today introduce the Beckham Capsule collection. You’re gonna want to read along here. It all started with a handwritten letter that David Beckham wrote when he was 18 years old. He had just scored his first goal and was looking for someone to sponsor him with some free boots. adidas accepted the talented, but at the time pretty unknown player’s humble request and if you fast forward 20 years, the partnership is still going strong. Now adidas present three all-leather Predator Accelerator revamps to celebrate what is one of the greatest partnerships in sporting history. One for the pitch, one for the court and one of the street. A lot of you might not be quite old enough to remember watching Zizou, Del Piero and David Beckham wearing the adidas Predator, but you will still know the legendary black, red and white look. Every Predator generation, and ACE for that matter, has had at least one model in the iconic colours and they are the inspiration for the colours used on the three beautiful shoes in the adidas x Beckham Capsule collection. The reason for making the on-pitch, cage and street version in these colours also comes from the clubs David Beckham has represented throughout his career. Red symbolises his time playing for England in their away-shirt, as well as Manchester United. White is for his time with Real Madrid and La Galaxy and to round things off beautifully, black honours his moves to AC Milan and PSG. Find your pair of the adidas x Beckham Capsule collection on unisportstore.com. Pitch, Court and Street can all be found here. The devil is the detail and as you can probably already tell, the adidas designers and David Beckham, who was heavily involved in the design process, have really obsessed about the small details on this collection. Everything from the thickness of the heel loop to the colour of the lace aglets has been thought about, but there is still one visual expression on each shoe that really takes this collection to the next level. Each of the new shoes feature two different sets of dates and minutes, which each represents the date of a game and time in that game, where he scored spectacular goals. For example, the red court shoe features 26.06.98 and the 29th minute, which is when he scored a direct free kick against Colombia at the 1998 World Cup. The adidas x Beckham Capsule collection combines the heritage of Predator with modern innovation, so the shoes all still keep up with peak performance. And although the two others are awesomely designed silhouettes, this marriage between old-school and new-school is especially apparent on the Triple-white football boot. The on-pitch version will undoubtedly also be the shoe that takes most of the headlines and catch most affection from boot collectors. The boot itself is made with a hybrid upper, which is part Primeknit and part kangaroo leather. This means it perfectly shapes itself to accommodate your foot shape and together with the high-top design it really makes you feel at one with your boot. On top of the kangaroo leather upper, the boot has also been designed with exactly the same grip patterns and form stripes, as the original adidas Predator Accelerator from 1998. An epic boot, which David Beckham himself highlighted as the boot he has the fondest memories wearing. It’s all almost a bit too much to believe, but you’re really not dreaming. The Limited Edition collection will be incredibly sought after and you don’t want to sleep on these or you will lose out.